Admiral Sir James Perowne KBE left the Royal Navy six years ago following a full and varied 37 year career. He specialised in submarines and commanded a diesel boat, HMS Opportune 1976-77, and a nuclear powered fleet submarine, HMS Superb 1981-83. He was awarded the OBE after his second command. Later he was placed in command of the Second Submarine Squadron consisting of ten nuclear powered fleet submarines. In 1996 he made it to the top of the submarine tree by being appointed as Flag Officer Submarines, the head of the submarine service. Not satisfied with just submarines, he was also sent to command two frigates, HMS Boxer 1986-88 – which included service in the Gulf during the Iran/Iraq tanker war – and HMS Norfolk where he was lucky enough to be the first Royal Navy ship in 22 years to visit Cape Town in 1994 after the boycott due to apartheid was finally ended. This command included command of the 6th Frigate Squadron numbering up to ten ships. He was posted to the British Embassy staff in Washington DC which started a strong and continuing liking for the USA and for the openness of its citizens. This relationship with the Americans was reinforced when, as his final posting in the service, he was sent to Norfolk, Virginia, to be the Deputy Supreme Allied Commander Atlantic in NATO – a job where he found it difficult to shave in the morning due to the permanent smile on his face! He was made a KBE during his appointment. 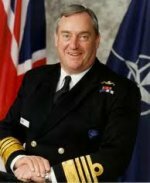 He continues his connections with the Services as President of The Submariners Association, as a trustee of The British Forces Foundation, and as President of the Royal Navy Benevolent Society to Officers and Association of Royal Navy Officers. He is also Chairman of the James Caird Society, promoting Sir Ernest Shackleton. Married to Nicola, with four grown-up sons, he enjoys golf, canal boating, and classic cars.